PowerPoint 2010 Training Materials are designed to teach employees how to use PowerPoint at a foundation level. Train staff what is new in PowerPoint 2010, how to create a presentation, arrange slides, how to use templates, view slide shows and more! Seeing is Believing This sample manual to teach PowerPoint 2010 Foundation is in MS Word format. Instructors will be delighted to offer such quality training to their students. Velsoft's customizable PowerPoint 2010 Training Materials completely describe how to use the various tools and options in the program. After completing the training for Office PowerPoint 2010, the results will be identifiable in the quality of work students are capable of producing. Having the option to customize the training materials your use for Office PowerPoint 2010 is an important aspect of creating a "results oriented" training plan. The content and form of the training materials must be responsive to the unique needs of the employee. Instructors have the option to accommodate the unique needs of their students using customizable training materials. PowerPoint 2010 Training Materials ensure that trainers and employees can easily follow the flow of information; step by step. Even through the most advanced applications of Office PowerPoint 2010, trainers can can easily guide the staff through the sections of the course. Our content is fully customizable, print on demand, has no hidden fees, and also features a 30 day money back guarantee. 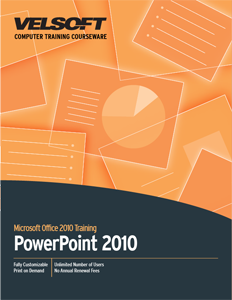 If you're looking for quality PowerPoint 2010 training, then look no further!